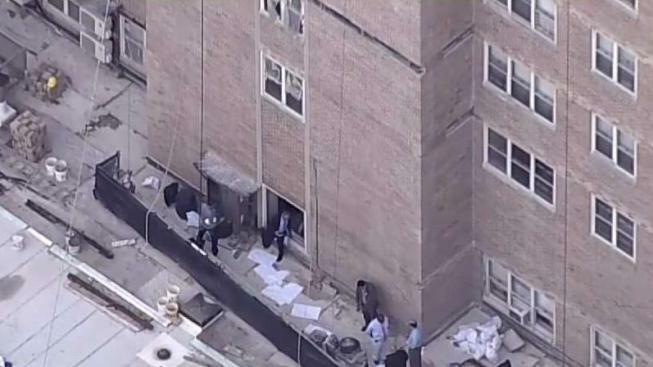 The city's Department of Buildings says it has issued a stop-work order at a Manhattan high-rise construction site where a piece of scaffold came loose Thursday and fell 12 stories, killing a 28-year-old man. Angel Ezpinoza of Staten Island, a construction worker, was hit by the beam in the courtyard of the Morningside Heights site on Riverside Drive early Thursday afternoon. He was pronounced dead at a hospital shortly thereafter. The general contractor for the site does have an active permit for facade repair, the Department of Buildings said, but the agency did issue a violation and full stop-work order as it investigates the circumstances surrounding the deadly accident. It also says additional enforcement actions are possible. The building, called the International House, is affiliated with Columbia University and houses some graduate and international students.